Mathematica has many useful features when it comes to Geo Computation. I wanted to check out some of these features for today’s post. I travel between Chennai and Bengaluru on official work. So, let us start by determining the on-road distance between these cities. That is not a big difference, but it still helps, if we ever decide to walk. Let us be more specific. We shall ask Mathematica to show the route to follow if we decide to walk this distance. So cycling uses the same route as walking, which is understandable. Next question is, assuming normal speeds, how long will each of these modes take? Great! The documentation tells us that traffic is not considered for these calculations. That makes sense, as otherwise the travel time cannot be determined with any degree of accuracy at all. Sadly, although I would like to find out the same set of information for train travel, Mathematica does not help us there. Only these three modes are supported for now. What else? There is a lot more, if you are interested! 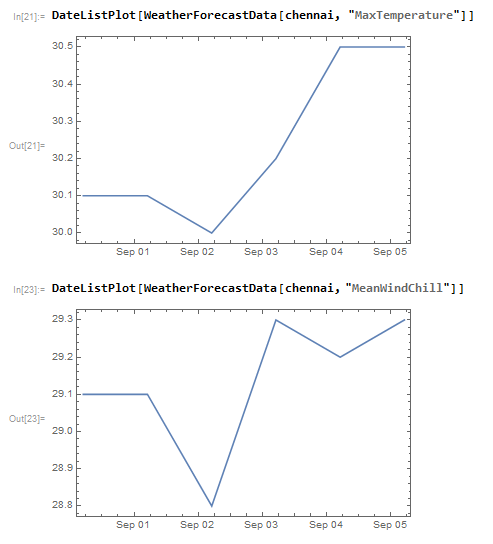 Before concluding this article, I wanted to check the weather forecast for Chennai for one week. See the following figure. So, Mathematica does not just provide the routine formulae and calculations; it is distinguished in its ability to give us access to a huge curated knowdgebase. I will explore more features in future posts.